Caption: This scanning electron microscopy image shows mouse macrophages (green) interacting with a fungal cell (blue). Macrophages are white blood cells that generally destroy foreign invaders by engulfing them. It’s a tried-and-true strategy, but it doesn’t always work. Cryptoccocus neoformans, a deadly fungal pathogen commonly found in the feces of pigeons, can foil even the best macrophages. No one has captured this grand escape—but researchers are getting a whole lot closer to doing so. Sabriya Stukes, an NIH-funded microbiologist at New York’s Albert Einstein College of Medicine, studies the interactions between C. neoformans and macrophages to determine how the former causes the lung infection cryptococcosis, which can be deadly for people with compromised immune systems. Stukes believes what makes C. neoformans so dangerous is that it can survive the acid death chamber inside macrophages—a situation that spells doom for most other pathogens. A big reason behind this fungus’s power of survival is its thick coat of polysaccharides, which serves as woolly-looking armor. Once a macrophage engulfs the fungus, this coat can give the white blood cell “indigestion,” prompting it to spit the fungus back into the lungs where it can cause disease. 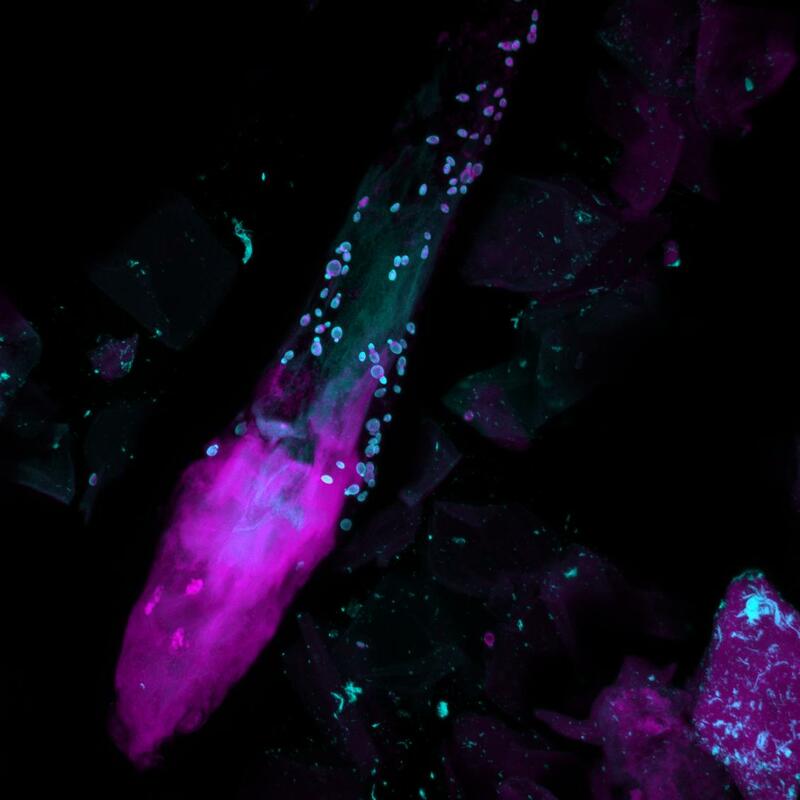 Caption: A fluorescent microscope image of a human hair shaft in the skin surrounded by bacteria (purple) and fungi (blue). Credit: Alex Valm, National Human Genome Research Institute, NIH. Athlete’s foot, ringworm, diaper rash, dandruff, some cases of sinusitis, and vaginal yeast infections are all caused by fungi. These microscopic co-travelers live in the air, water, soil, and, so it happens, on our body. NIH researchers have just completed the first census of the fungi that live on the human body, and it’s quite a diverse collection .